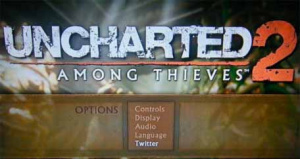 Uncharted 2: Among Thieves Will Feature Twitter Integration. Awesome. Apparently Naughty Dog want to put us all to shame. With solid ranking, stat tracking, match making and gameplay already in place, they have just one more trick up their sleeve. Twitter. As demonstrated on Jeff Rubenstein's Twitter page, Uncharted 2 can actually plug into your Twitter account and alert status updates based on trophy unlocks and multiplayer games. This all links to Naughty Dog's central hub page containing stats for you abilities in the game. Pretty awesome right. Tacked-on multiplayer... Tut.